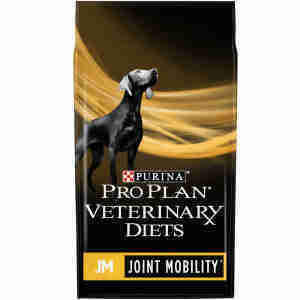 PURINA PROPLAN VETERINARY DIETS Canine JM Joint Mobility is specifically formulated to ensure your pet has improved levels of mobility. This contains high levels of protein and moderate fat levels, which helps reduce stress on your pet's joints. Ingredients: Rice, Dehydrated Salmon Protein, Wheat Flour, Dehydrated Poultry Protein, Maize Gluten Meal, Dried Egg, Maize, Digest, Fish Oil, Pea Fibre, Animal Fat, Minerals. Nutrition: Analytical Constituents, Protein: 30.0 %, Fat content: 12.0 %, Crude ash: 7.0 %, Crude fibres: 2.5 %, EPA and DHA: 0.8 %, Additives: Nutritional Additives IU/kg: Vit A: 30 000, Vit D3: 1000, Vit E: 940, mg/kg: Vit C : 140, Ferrous sulphate monohydrate: 275, Calcium iodate anhydrous: 3.6, Cupric sulphate pentahydrate: 55, Manganous sulphate monohydrate: 110, Zinc sulphate monohydrate: 470, Sodium selenite: 0.32. *The recommended period of use is initially up to 3 months. It is recommended that a veterinarian's opinion be sought before use or before extending the period of use. For puppies, consult your veterinarian on recommended feeding guidelines. For weight loss the indicated amounts should be given until ideal body weight is achieved and then gradually increased to maintenance levels. Water should always be available.